The little village of Rouex in the Pas-de-Calais is a quiet backwater now but during the First World War it was the scene of heavy fighting – particularly during the Battle of Arras in April 1917. 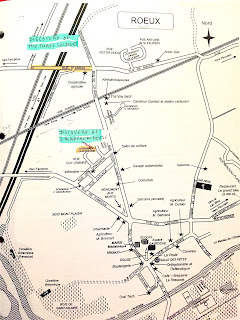 The Usine chimique Lesage (Chemical Factory) and the nearby Chateau Lesage are long gone and the area between the railway line to the North of the town and the River Scarpe to the South is now a residential area. The site of the chemical factory is now a car park and a small provincial supermarket. Behind the supermarket rough ground covers the remains of a vast complex of military bunkers and passageways unused and unseen for almost 100 years. During the summer of 1992, a local resident, Jean-Louis Bulcke who was born in Douai, Northern France and still has family links in the area was erecting a new garden wall on his nephew’s property in Rue Guy Lemaire, Roeux. 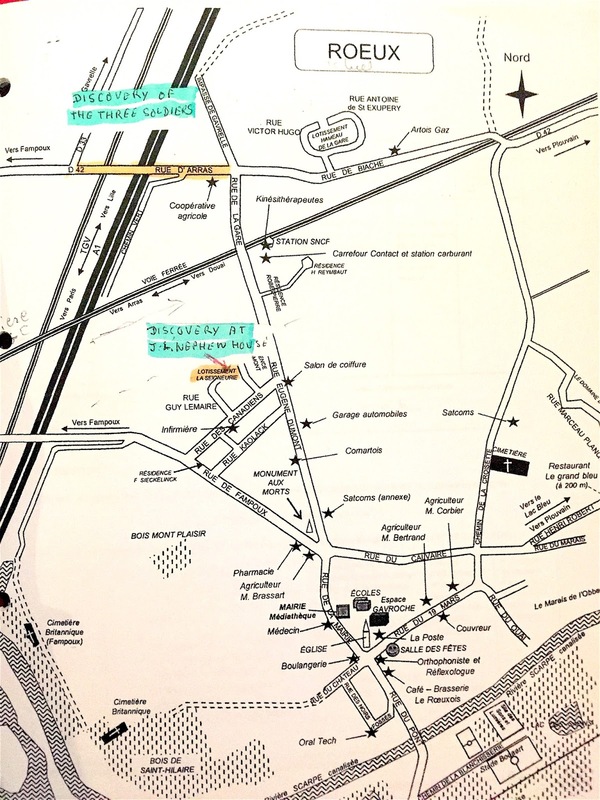 The property is situated 200 metres to the North West of where the Chateau Lesage once stood. Also there is a large German bunker built in 1917 which has been incorporated into a neighbour’s garden nearby. The digging of the foundation of a new wall at the nephew’s former home very quickly revealed evidence of the areas’ turbulent past. 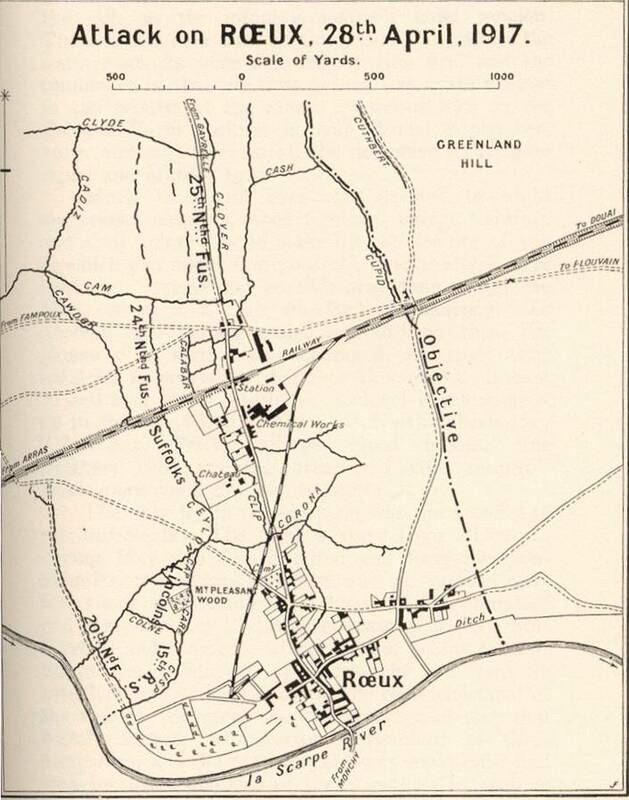 During the April 1917 Arras offensive the British Front Line just to the West of Rouex was held by 101st Brigade, 34th Division. On the 28th April 1917 the Division attacked the German lines to their East. In the village, the 11th Suffolks attacked the area of the old chemical works and the chateau. The 10th Lincolns were on their right and the 15th Royal Scots beyond them with the River on their flank. It was a difficult day. The initial attack faltered in the face of strong resistance and of the 17 officers and 610 men of the 11th Suffolks who went into the assault 7 officers and 325 other ranks became casualties. Of those 103 men were killed. "The Suffolks met with the same fate as the 24th Northumberlands, being met by machine gun fire from a trench untouched by the barrage and from buildings. They made no progress, and at 5:30 A.M. Major Tuck, Second in Command, being sent up to reorganise the Battalion, found only five officers and about three hundred other ranks in our front line, including about sixty men from the 16th Royal Scots. Some of the Suffolks got as far as the houses near the Chemical Works, and Stayed till dark, when they returned with some prisoners." Jean-Louis’ nephew’s former home on the modern day Rue Guy Lemaire was built dead centre to the 11th Suffolk line of attack – “near the chemical works”. 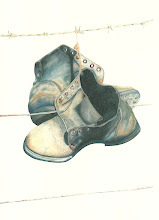 Shortly after starting the work in his nephew’s garden, Jean Louis came across the remains of a British soldier. The body was in a contorted position and there were a number of artefacts in the immediate vicinity. These included a British helmet, a ‘Cambs Suffolks’ shoulder badge and a spoon on which the number ‘7203’ had been scratched. Also a pocket watch was found that still showed the time at 4:45am. Given the attack started at 4:25am the soldier had faced the danger of enemy fire for 20 minutes before he was killed. The body was exhumed and certified by a local doctor. 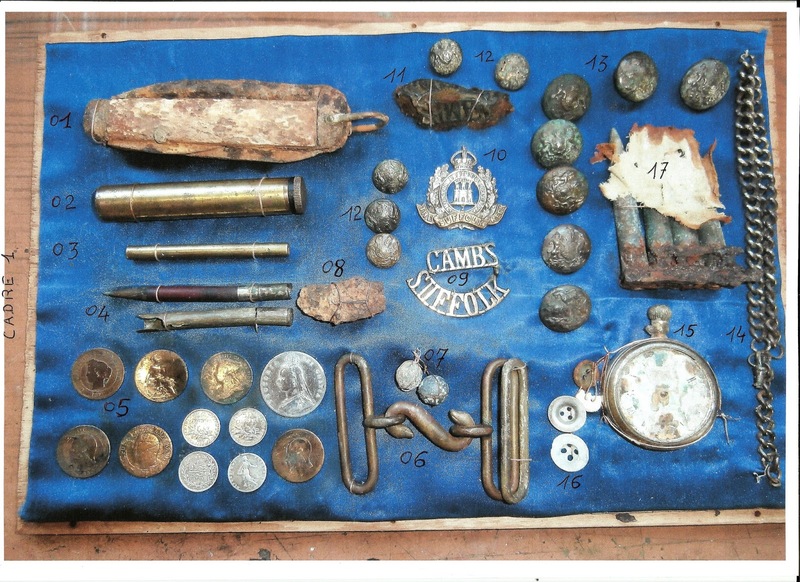 The remains along with the spoon were handed over to the Gendarmerie who subsequently passed them onto the Commonwealth War Graves Commission in Beaurins. Unfortunately documents concerning these transfers are not available but Jean Louis subsequently established that the soldier was buried as ‘unknown’ at Terlingthun British Cemetery near Boulogne St Mare. He believes that that the remains lie in Plot 20, 9th grave to the left. This follows a precedent since two Roeux casualties were buried in the same cemetery in 1984. 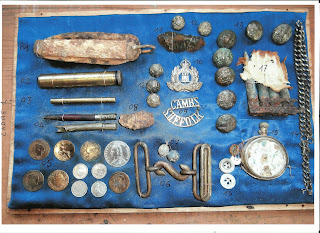 Most of the artefacts had been retained by Jean-Louis who now wishes to return them to England and to the family of the brave soldier who was killed in action on the 28th April 1917. 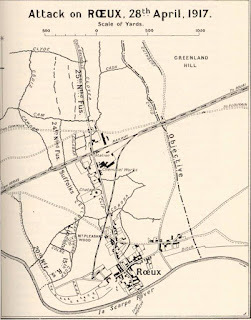 Subsequent research of the 11th Battalion Suffolk casualties in Rouex revealed 79 ‘missing in action’. Of these Lance Serjeant Charles William Stevens of A Company proved to be a likely match for the man found by Jean Louis. His regimental number was 17203 which matches with the number on the spoon – ‘7203’. Lance Serjeant Stevens enlisted into the Cambs Suffolks in December 1914 and CWGC records show that he was the son of Susannah Louisa Stevens of Cavendish Road, Mill Road, Cambridge and the late Charles Stevens formerly of Swaffham Bulbeck, Cambridgeshire whose ancestors were five generations of blacksmiths from that village. Lance Serjeant Stevens was 42 when he was killed and he left a widow, Susannah Jane Stevens of 18 Cyprus Road, Cambridge. He was also father to a son and three daughters. 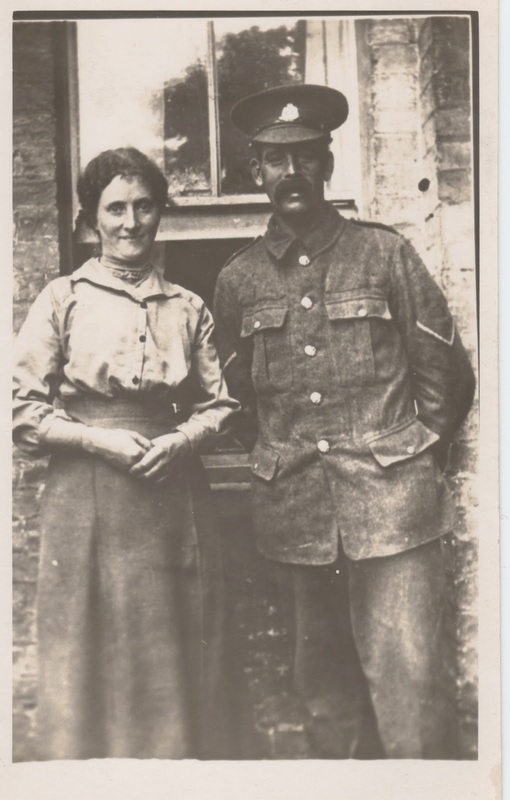 Jean-Louis and his English speaking friend Maurice Vallat who sadly died last August confirmed the soldiers identity via the ‘Walking the Battlefields’ Cambs Suffolks online archive. Using this information Jean-Louis and Maurice found a link to Colin Fakes of Hauxton. 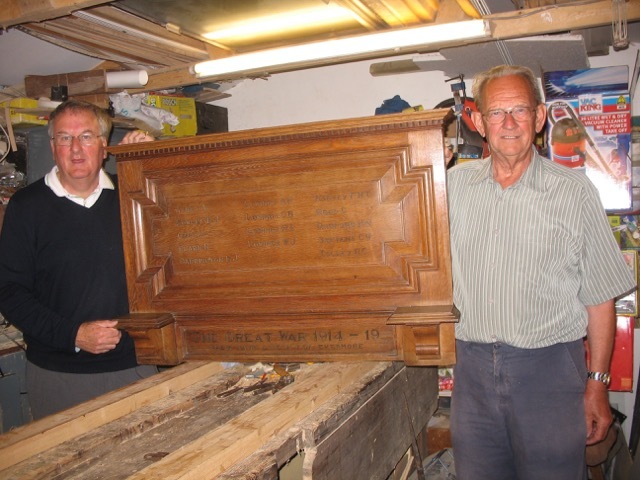 Colin is the grandson of Lance Serjeant Stevens and in 2011 had been instrumental in the re-dedication of a WW1 memorial found in a damaged state in the cellar of the former Methodist Church in Mill Road, Cambridge - now called Romsey Mill. Charles William Stevens' name is commemorated along with 13 others. This project was publicised on the internet and Colin's name and contact details were quickly discovered. In April 2013 Colin received a phone call from Maurice in France who said, “we have found your Grandfather”. Colin’s mother, Ida was the youngest daughter of Lance Serjeant Stevens. Colin subsequently visited the site of his Grandfather’s action in France with Jean Louis as a guide. He described the experience as a “sad but incredible pilgrimage”. Despite the wholehearted support of Lance Serjeant Stevens’ Grandson, Colin Fakes of Hauxton Cambridge together with his relations, the CWGC have so far declined to reclassify Stevens’ grave as ‘known’. Furthermore the CWGC have refused to review their files for 1992 on the grounds that to do so would ‘Set an unhelpful precedent’. A ‘Freedom of Information’ request for details of the small number of burials in 1992 was rejected by the CWGC on the grounds that they are exempt from the Act. Sadly, a DNA test involving small quantities of hair and bone from the original gravesite in Rouex has proved to be inconclusive. The small and contaminated sample simply wasn't enough to produce a definitive result. 28th April 2017 will be the 100th Anniversary of Lance Serjeant Steven’s death during the Battle of Arras. Colin, his wider family, Jean Louis and myself are determined that Lance Serjeant Stevens should be accorded the rightful honour of a named CWGC headstone. 12th November 2016. Phil Curme & Gerald Main talk about the Cambs Suffolks on Radio Cambridgeshire.